Cookies disallowed: Store administrators can configure the system to redirect customers to Enable Cookies page automatically, which describes how to make the recommended settings with most browsers. On the admin sidebar click Stores, under Settings click Configurations. On the left of the panel under General, click Web. Set Redirect to CMS-page if Cookies are Disabled to “Yes” to display guidelines that describe how to configure the browser to allow cookies. Click Save Config after completed.Above is a tutorial on configuring browser capabilities detection in Magento 2 admin panel. We hope that you can display the most recommended settings and provide the best experience for your customers. If you have any question or have any request, please leave a comment or contact us directly. On the next article, we will describe a complete guideline of action log for store administrators using Magento 2 platform. So like and share if you think this article is useful, and don’t forget to subscribe Magestandard to tracking our Magento 2 tutorial article. See you in the next blog post. In Magento Open Source default installation, you can validate session variables to avoid session fixation attacks, or attempts to infect or sniff user sessions. The Session Validation Settings decide how to validate session variables during each store visit, and if the session ID is added to the URL of your online store. The validation checks to see that visitors are who they say they are by comparing the value in the validation variables with the session data that is saved in $_SESSION data for the user. If the information is not transferred as expected, and the corresponding variable is null, that means validation fails. Depending on the session validation settings, if a session variable fails the validation step, the client session immediately terminates. Enabling all of the validation variables can help prevent attacks, but might also decrease the performance of the server. In the default installation, all session variable validation is disabled. We recommend that you test with the settings to find the best combination for your Magento installation. Activating all of the validation variables might prove to be unduly restrictive, and prevent access to customers who have Internet connections that pass through a proxy server, or that originate from behind a firewall. To learn more about session variables and their use, see the system administration documentation for your Linux system. Set Validate REMOTE_ADDR to “Yes” to verify that the IP address of a request matches what is stored in the $_SESSION variable. Set Validate HTTP_VIA to “Yes” to verify that the proxy address of an incoming request matches what is saved in the $_SESSION variable. Set Validate HTTP_X_FORWARDED_FOR to “Yes” to verify that the forwarded-for address of a request matches what is saved in the $_SESSION variable. Set Validate HTTP_USER_AGENT to “Yes” to verify that the browser or device that is used to access the store during a session matches what is saved in the $_SESSION variable. To protect passwords and other important data, Magento uses an encryption key. An industry-standard Advanced Encryption Standard (AES-256) algorithm is used to encrypt all data that requires decryption. This includes credit card data and integration (payment and shipping module) passwords. Besides, this algorithm is used to hash all data that does not require decryption. During the process of installation, you are allowed to either let Magento generate an encryption key itself, or you can create one of your own. The Encryption Key tool allows you to change the key as needed. The encryption key should be turned on to improve security, as well as at any time the original key might be compromised. Whenever the key is changed, all legacy data is re-encoded using the new key. For technical information, see Install the Magento software in the developer documentation. In this article, we will describe how to make a file writable and how to change the encryption key in Magento 2 admin panel. On the Admin sidebar, tap System. Then under Other Settings, choose Manage Encryption Key. Save a record of the new key in a safe place. It will be required to decrypt the data if any problems occur with your files.Above is a tutorial on how to use the encryption key in Magento 2 admin panel. We hope that you can make your web store secure. See you in the next post. CAPTCHA (Completely Automated Public Turing test to tell Computers and Humans Apart) is a verification method that makes sure that a human being is interacting with websites. It can be used for admin login and customer logins. You can click the Reload button to reload the CAPTCHA. The CAPTCHA is configurable and can be set to display every time or only after some failed login attempts. Enter the Font for the CAPTCHA symbols. Default font: LinLibertine. You can add your font by putting the font file in the same directory as your Magento instance, declare in the config.xml file of the Captcha module at app/code/Magento/Captcha/etc. Always CAPTCHA is always required to log in the Admin. After a number of attempts to login In the field Number of Unsuccessful Attempts to Login, enter the number of login attempts allowed. Input 0 to Displaying Mode to Always. This option does not cover the Forgot Password form. If CAPTCHA is enabled and configured to display on this form, then it is always included on the form. Enter the Number of Unsuccessful Attempts to Login before the CAPTCHA displays. If enter 0, the CAPTCHA is always used. In the CAPTCHA Timeout (minutes) field, enter the number of minutes before the CAPTCHA expires. When the CAPTCHA expires, the user must reload the page. Enter the Number of Symbols used in the CAPTCHA, the maximum number is eight. In the Symbols Used in the CAPTCHA field, specify the symbols that can be used in the CAPTCHA. You can configure to force the customer to enter the CAPTCHA each time to login or after a certain time of login failed. Enter the name of the font for CAPTCHA symbols. Enter the Number of Symbols in the CAPTCHA, the maximum number is eight. Set Case Sensitive to “Yes” to include uppercase and lowercase in your CAPTCHA. 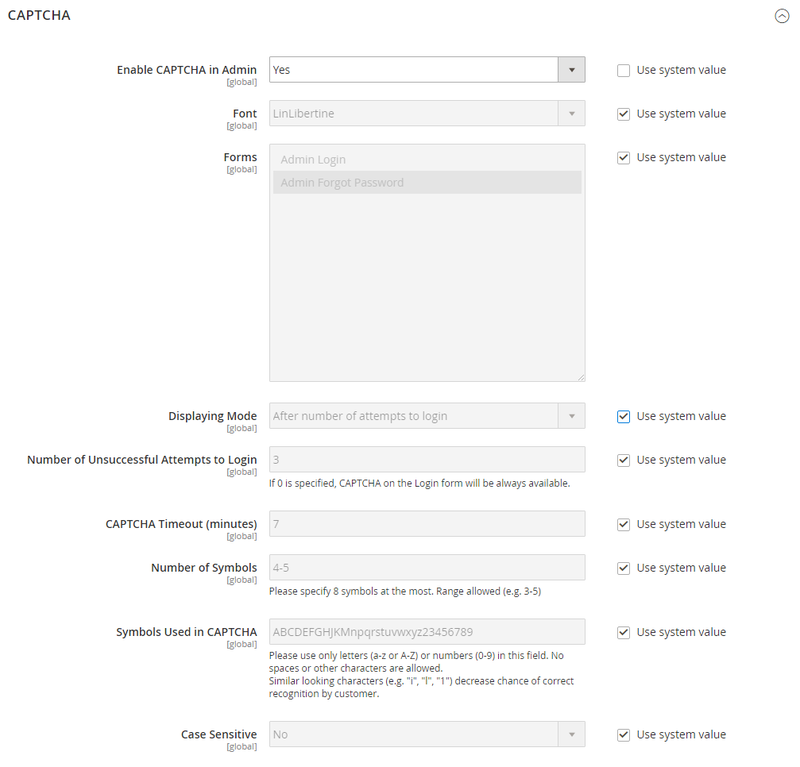 Configuring Security In Magento 2 Admin Panel is an important work. The first thing you have to do after installed Magento on the server implements a custom admin URL. 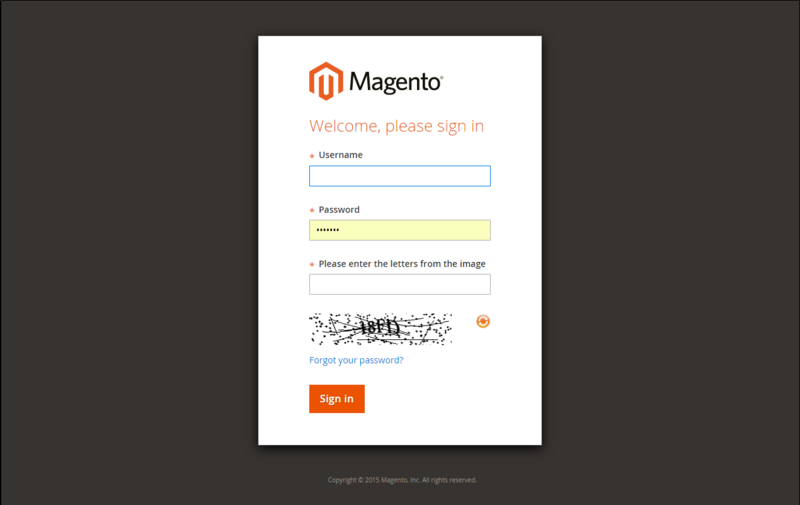 In the default installation of Magento, the admin password must be seven or more characters long including uppercase, lowercase, numbers, and symbols. For higher security, you can implement two-factor authentication that generates a token on the mobile device. The Admin Security Configuration allows store administrators to add a secret key to URLs, require a password to be case sensitive, restrict admin sessions length, the lifetime of the password, the number of login attempts before the system lock admin user account. For additional security, the Admin login can require a CAPTCHA. Set Admin Account Sharing to “No” so admin cannot login from the same account on different devices. By IP and Email You can reset the password online after received a response from the notification is sent to the email address integrated with the Admin account. By IP You can reset the password online without additional confirmation. By Email You can reset the password only by responding by email to the notification that is sent to the email address integrated with the Admin account. None Only the store administrator can reset the password. Recovery Link Expiration Period (hours): enter the number of hours a password recovery link remains valid. 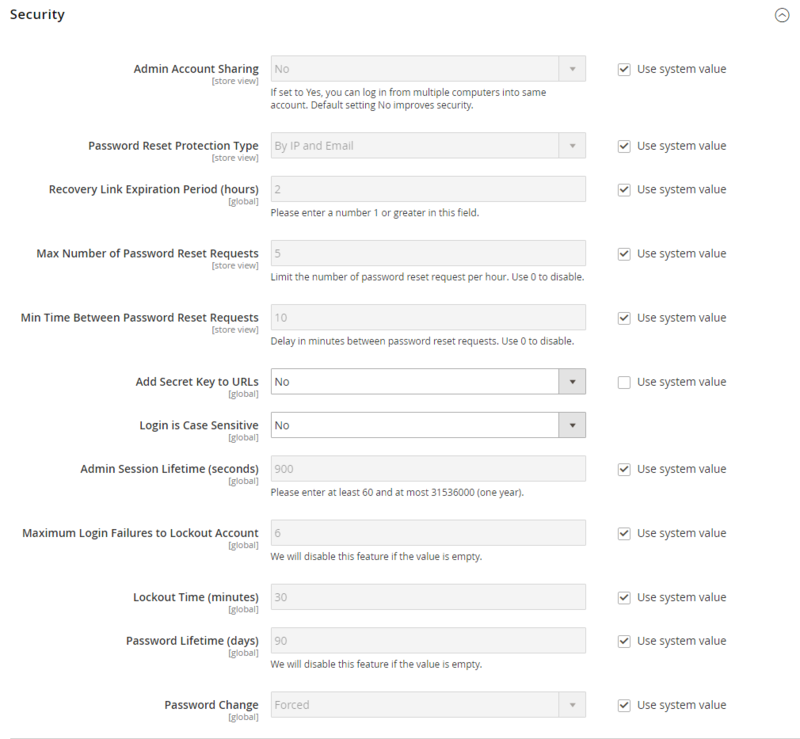 Max Number of Password Reset Requests: determine the maximum number of password requests that can be submitted per hour. Min Time Between Password Reset Requests field: enter the minimum number of minutes that must pass between password reset requests. 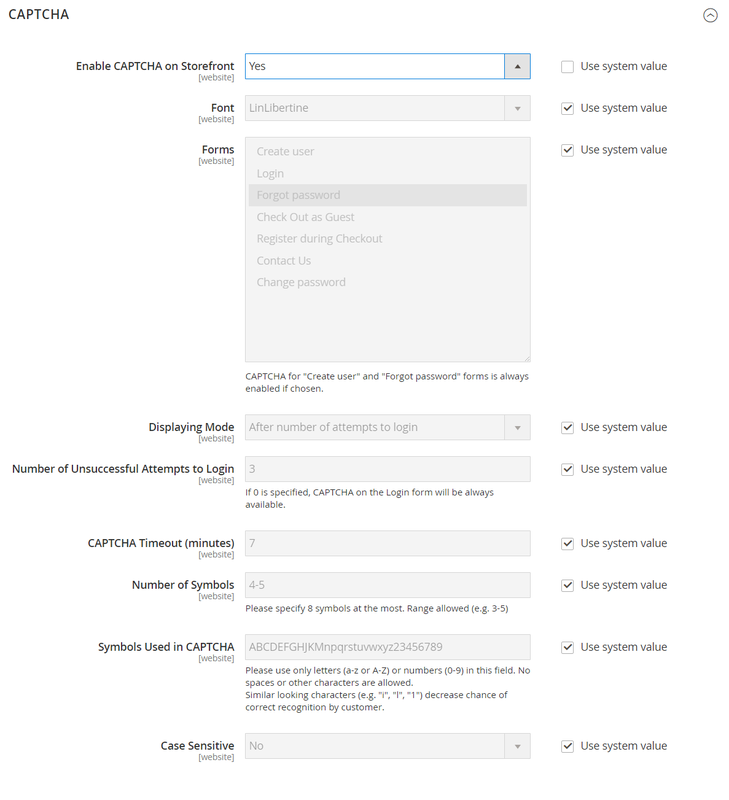 Set Login is Case Sensitive to “Yes” to require that the use of uppercase and lowercase characters in any login processes entered match what is stored in the system. Admin Session Lifetime (seconds): determine the length of an Admin session before it times out, the value must be 60 seconds or higher. Maximum Login Failures to Lockout Account: Enter the number of times a user can log in to the Admin account before it is locked. In the default installation, six attempts are allowed. Empty the field for unlimited login attempts. Lockout Time (minutes) field: enter the minutes that an Admin account is locked when reached the maximum number of attempts. Password Lifetime (days): Enter the number of days a password is valid to limit the lifetime of Admin passwords. For an unlimited lifetime, leave the field blank. Forced Requires to change Admin users passwords after the account is set up. Recommended Recommends changing Admin users passwords after the account is set up. Password An Admin password must be at least seven characters long including uppercase, lowercase, numbers and symbols.